These pages are from the new book on the legends and history of the Kabbalah and the Sefer Raziel, Kabbalah's Secret Circles, Read some of the chapters and download a free PDF sample of the book to preview. Also, download other free books on Kabbalah. Read sample pages of Kabbalah's Secret Circles. The main legend of Book of the Angel Raziel is that it originated when G-d gave the Secret Knowledge to the Archangel Raziel. The Hebrew word "Raziel" means "Secret of G-d". 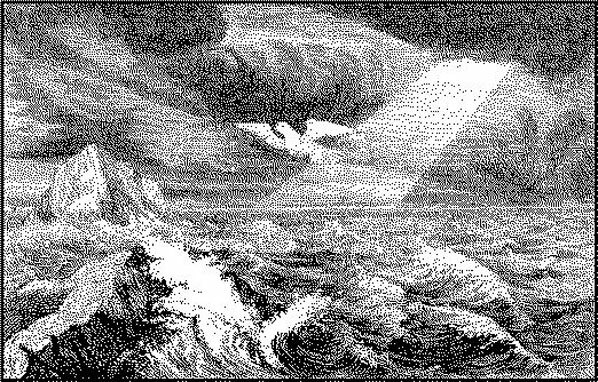 The archangel Raziel's mission is the transmitter of secrets (from the "Jewish Encyclopedia," p 335). The Book of Raziel, in Hebrew is called Sefer Raziel, was originally inscribed on a sapphire stone, according to some legends. According to Targum Koheles (10, 20), a collection of midrash taken from the book of Ecclesiastes, the angel Raziel stood on the peak of Mount Horeb (Chorev). Every day he shouted out the secrets to all to hear. To preserve this wisdom, the angel Raziel inscribed those secrets in a book and gave it to Adam. See chapters from Sefer Raziel. "Each day the angel Raziel makes proclamations on Mount Horeb, from heaven, of the secrets of men to all that dwell upon the earth, and his voice resounds throughout the world." A targum is a version or "a translation." The name Targum is usually applied to the Aramaic and is called the Chaldean or Chaldaic Jewish version of the Hebrew Scriptures, or any part of them. It was first named in the Slavonic Book of Enoch written before the common era under the name "Raguel" or "Rasuel," he is mentioned together with Shemiel or Shemuel. (Jewish Encyc 1, 591). A copy of the Sefer (Hebrew for book) was given to Seraph, then Metatron, then Adam (the first man). According to the tradition of the Book of Raziel, the angels (called Cherubim) were upset that the secret knowledge was given to Adam. They descended to earth to steal the book back from Adam. It was then tossed deep into the ocean. According to Jewish tradition, G-d ordered Rehab to retrieve the book and return it to Adam. The book was stolen again and ended at the bottom of the ocean for centuries. The Sefer (book) was later retrieved by Raphael, who gave it to Noah to protect him during the flood. Eventually, it was given to King Solomon by a Babylonia prince. In the 11th century, the book disappeared. Raziel or Azkariel - Ak(h)raziel - was also known as Gabriel, the Angel of Proclamation, according to Gustav Davidson in "A Dictionary of Angels." A Hebrew version, Sodei Razya Sefer HaShem, is attributed to Rabbi Eleazar of Germiza (Eleazar Judah of Worms or also called R. Eleazar ben Judah ben Kalonymus of Wurms, c 1160-1237). A 15th century Italian translation had also been discovered. The current translation now used is from this medieval Kabbalistic grimoire, first written in Hebrew and Aramaic, and then in Latin, before being translated into English. Earlier editions may predate the 13th century. The Sepher Raziel was also called Liber Salomonis, a full grimoire in the Solomonic tradition from a sixteenth century manuscript. The first printed edition was published 1701 in Amsterdam. Since then, dozens of editions have been printed in mostly Hebrew. a Book of Names and their virtues and properties, being seven semiforas of Adam and seven semiforas of Moses. The folklore surrounding the book advises to keep a copy of the Sepher in your house to bring a special Divine blessing. The book is said to protect the home from fire. People also keep a copy in their wallet or purse, or sleep with it under their pillow. The book is also recommended for pregnant women to assist an easy birth. 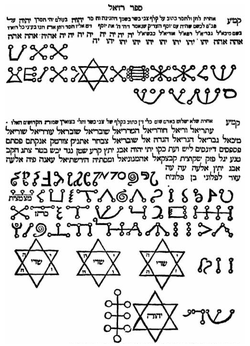 (left: a page excerpt from Sefer Raziel HaMalakh, featuring various magical sigils (or seguloth, in Hebrew). The Hebrew spelling for the angel names varies depending on who is translating the sounds of the Hebrew letters. Various spellings include Raziel, Ratziel, Raziel, Reziel, Razial, Retziel, Reziel, Rezial, etc. These Hebrew letters translate into English letters as RAZIAL or RAZIEL. Sefer means book in Hebrew. Sefer (Sepher) Ratziel is also known as Sefer Raziel, Sefer Reziel, Sefer Rezial, Razial, Rzeal, Sefer Retziel and Sefer Reziel, among others Sefer RZL. In Hebrew, the book is called "Sefer Raziel HaMalach." Also there are various spellings for the Hebrew word HaMalach, which means the King. This word is also spelled as HaMalak, HaMeleck, HaMeclech, HaMelech, HaMalech. Published Books about "Sefer Raziel"
Several sources on Amazon sell paperback copies of the Sefer Raziel in Hebrew and English. This is the best source to buy a printed edition. This is an original Hebrew version book on the "Sefer Raziel" from Amazon. Paperback. This reprint is being made available at cost by Publish Your Sefer.com in partnership with Hebrew Books.org. 2012 edition, 98 pages. 7.8 x 0.2 x 9 inches. This is the first English translation from ancient Hebrew of the rare and complete 1701 Amsterdam edition by Steve Savedow. Includes an explanatory text on the holy names of God, the divisions of Heaven and Hell, and the names and hierarchy of the angels and spirits. Paperback: 320 pages. Publisher: Weiser Books (December, 2000). Language: English. Although it is comprehensive and has translations of the text, there has been controversy over Savedow's translations. It is a good starting point if you can't read Hebrew. This volume also includes a foreword which offers an overview of the Sepher Raziel manuscripts, which represent a number of independent traditions. It includes an essay on the literature of Solomonic magic in English, an introduction to the Sepher Raziel manuscript presented, an appendix on incense nomenclature as a supplement to Tractatus Thymiamatus, a list of printed notices and manuscript sources of Sepher Raziel, and a full bibliography of printed works on Solomonic magic and items of related interest. 296 pages. Publisher: Llewellyn Publications (September 8, 2010). This book is highly recommended as a reliable source of information. Watch free movies and get news, features and more! Copyright by Robert Zucker 1995-2017 No part may be copied, reproduced, republished or digitally stored without permission from author.